Το όνομα Ορσαλία είναι παράγωγο του Ουρσουλα. 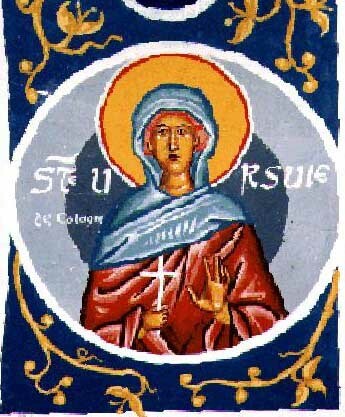 Saint Ursula ("small female bear" in Latin) is a British Christian saint. Her feast day in the Roman Catholic Church is October 21. Because of the lack of sure information about the anonymous group of holy virgins who on some uncertain date were killed at Cologne, their commemoration was omitted from the Roman Catholic calendar of saints for universal liturgical celebration, when this was revised in 1969, but they have been kept in the Roman Martyrology, the official, though incomplete, list of saints of the Roman Catholic Church. Her legend, probably unhistorical, is that she was a Romano-British princess who, at the request of her father King Donaut of Dumnonia in south-west England, set sail to join her future husband, the pagan Governor Conan Meriadoc of Armorica (Brittany), along with 11,000 virginal handmaidens. However, a miraculous storm brought them over the sea in a single day to a Gaulish port, where Ursula declared that before her marriage she would undertake a pan-European pilgrimage. She headed for Rome, with her followers, and persuaded the Pope, Cyriacus (unknown in the pontifical records), and Sulpicius, Bishop of Ravenna, to join them. After setting out for Cologne, which was being besieged by Huns, all the virgins were beheaded in a dreadful massacre. The Huns' leader shot Ursula dead, supposedly in 383 (the date varies).